Chris Hughton praised Albion's character after they fought back from 2-0 down to draw 2-2 at Southampton this evening. 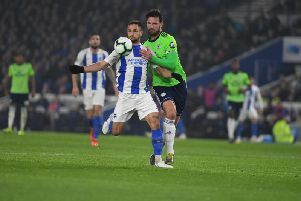 Goals from Shane Duffy and Glenn Murray earned Albion a point, after Pierre-Emile Hojbjerg and Danny Ings had put the Saints in control. "We showed great character but the disappointment wasn't so much going in at 1-0 down because it was a great strike by the lad but the level of performance in the first half period. "Having said that, I was still relatively confident we might go in at 0-0 and change a few things and change a few mentalities but the over-riding feeling is good." "If our performance in the second half was the same as the first, then we're struggling to get anything but we upped the intensity, which we had to do. "We pressed better and broke well. I was confident in the second half that we would create chances and once we got the one back, if you looked at the momentum if somebody was going to score, I felt it was going to be us. "I can say what I need to say and shout as much as I want but you've got to have a group of players that realise things themselves. "There isn't a player who came in at half-time who didn't realise the team had under-performed. You can't do it in this division and get away with it." "In this division if you're 2-0 down away from home, on most occasions you dont come back. I felt we could score because I thought we broke well, even before the first goal. "But until you get the first goal, it's a hard trek to get back and get two goals." "I thought both were penalties. No complaints with the one given against us and I thought the one given for us was one." "He's okay. He got a kick in the last game, which has ended up a little bit more troublesome than what we thought. "It's certainly nothing that's going to be longer term. We'll look over the next week what progress he makes." "He's fit. It's managing him the best way we can. "We just need to make sure he's up to speed before he plays."